A couple of weeks ago, I did a thing. Shortly after launching, Jay.Life, LLC — my speaking/consulting/writing “firm” — I landed a consulting gig. Nice, as that was pretty much the point in the launch. My intended practice is to never mention my consulting clients, what I do for them, what they do for me, NOTHING. All that is between me and the client — as it should be. It’s not that I’m trying to hide anything, of course I’m not. No, there is nothing in the consulting world akin to the “attorney / client privilege.” But as a matter of privacy and respect, there simply won’t be public discussion. If/when I take a consulting position, that’s between me and my client. The exception, of course, would be if the client wants to disclose something. That’s what happened a couple of weeks ago. 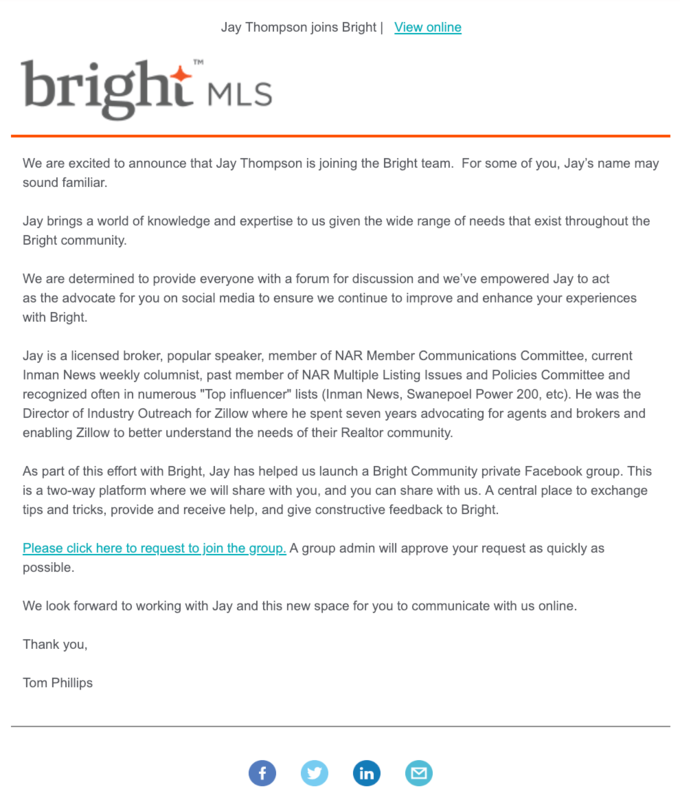 Bright MLS, a regional Mid-Atlantic Multiple Listing Service, announced to their subscriber base that I was working with them. WITH them, not FOR them; there is a significant difference between those two words. This past week, a large industry conference was held, and many expressed the same sentiments. I get it. The email copy can easily be interpreted as I’ve gotten myself into a full-time, W-2 employee relationship with Bright. Being sincerely impressed with the Bright staff and leadership I’ve been working WITH (not FOR), I can’t see that happening. Yes, there are a lot of challenges in this role, but that’s a good thing. I wouldn’t have taken on some boring, pointless work. I don’t have to work–I’m retired; and I’m loving every minute of it. So fear not friends, family, and followers, I didn’t throw in the towel on retirement after only six months. I’ve just added something to keep me busy, to please my financial planner (who is a big fan of having supplemental income in retirement), and to help both Bright MLS and, importantly, the real estate agents and brokers who use it. So, what the hell, why not? Since I have zero desire or need to consult full-time, this gig actually closes my consulting calendar. I suspect over time the hours will taper off, allowing me to take on another client or two. Maybe, if I want to. If you’ve got a need or just want to chat about possibilities, hit me up on the Jay.Life site.